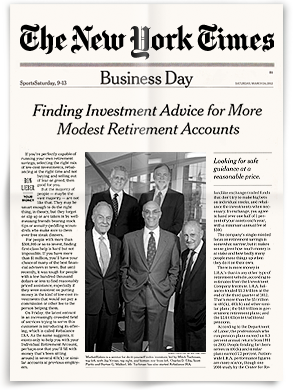 Managing Director Mitch Tuchman spoke with Pittsburgh Post-Gazette on how low-cost index funds can save your retirement from high commission fees. While the fees and commissions charged by most traditional brokers and investment advisers may seem like an insignificant amount to pay for financial advice, those tiny 2 percent charges can add up over time — swallowing a sizable chunk of what investors would have ended up with at retirement. In an investor bulletin from the Securities and Exchange Commission, the federal oversight agency illustrated how $100,000 invested over 20 years with a 4 percent annual return was systematically stripped down by ongoing fees of 0.25 percent, 0.50 percent and 1 percent. After 20 years, an annual fee of 1 percent reduced the portfolio that should have ended up with $220,000 to about $192,000. A portfolio subjected to 0.50 percent annual fees was cut down by $20,000. And 0.25 percent fees knocked about $10,000 off the total return. The fees used by the SEC for the illustration are somewhat conservative, considering that many traditional wealth managers charge about 2 percent, not including other service fees often concealed in the fine print. Many advisers typically charge a minimum of 1 percent to 2 percent of the assets being managed. And they often outsource the job of picking stocks to mutual funds. Those funds typically add up to another 1.25 percent in annual charges, meaning the client is usually in the hole for 2.25 percent each year. If inflation runs about 3 percent and the market returns 7 percent, the client is barely breaking even. “The fees on an investment can end up consuming the majority of your return on an investment,” said Eric Tyson, author of ”Investing For Dummies.” He cautions investors to read all documents related to an investment — such as the prospectus — to determine what fees they will be charged. Some charges from advisers and the mutual fund companies they deal with include annual account fees, custodian fees, back end or surrender charges, front loads, transaction fees, management fees and even 12b-1 fees or other marketing expenses. Mitch Tuchman, Managing Director at Rebalance based in Palo Alto, Calif., said his company, which has $350 million in assets under management, offers investment advice for 0.50 percent on all accounts. He said the fees can be low because the company uses a robo investor model combined with human advisers who provide advice over the telephone. The company also does not buy individual stocks or mutual funds, which often carry higher commissions and charges, but instead invests in low-cost index funds. The SEC advises investors to find out what they are being charged by reading the documents the financial professional provides. For example, look at account opening documents, account statements, confirmations and any product-specific documents to see the types and amount of fees. Some questions to ask are: What are the fees relating to this account? Do you have a fee schedule that lists all the fees that will be charged for investments and maintenance of this account? What fees will I pay to purchase, hold and sell this investment? Will those fees appear clearly on my account statement or my confirmation? I open a different type of account? How much does the investment have to increase in value before I break even? Commission charges and other account fees have always been a fact of life in the investment world, but some investors may have been made even more aware of them in recent months when it seemed the bull market was fading. Chicago-based securities lawyer Andrew Stoltmann said he has been involved in several lawsuits and arbitration claims involving clients and financial advisers related to what the client felt were unreasonable fees charged to an account. He said the legal actions were usually triggered by losses or long-term investment under-performance. For a link to the SEC’s investor bulletin on fees: www.investor.gov/ news-alerts/ investor-bulletins. She suggests that people with smaller accounts could benefit from buying shares in a well-diversified and managed mutual fund, or enrolling in a target date fund that automatically adjust to a more conservative mix of assets as the account owner gets closer to retirement. Another option would be to meet with a portfolio manager, pay a flat fee for advice and manage the portfolio using that advice. One company that offers that service is Garrett Planning Network, a nationwide network of fee-only financial advisers — most of whom are certified financial planners. Clients choose from a list of about 320 advisers who charge $180 to $240 an hour for a telephone consultation on portfolio management, which the client implements. “We are here to make competent, objective advice accessible to all people,” said Sheryl Garrett, founder of the network. Rebalance, based in Palo Alto, Calif., was founded two years ago to manage money for people who had saved $100,000 to $500,000. Each client gets an adviser for an annual fee of 0.5 percent, which amounts to $500 for a $100,000 account. An advisory committee of investment industry professionals creates a handful of model portfolios and the company invests its clients money in those models based on their individual needs, said Mitch Tuchman, co-founder and Managing Director of Rebalance.